"This week's challenge is based on this inspiration photo of "Butterflies". Make a project, card, or tag inspired by the photo. Then tell us why you love butterflies." My card ended up pretty clean and simple. When I thought about what I wanted to make for this challenge, all that came to mind was to use the Summer Smooches DSP. I love the bright and cheerful colors in that paper! 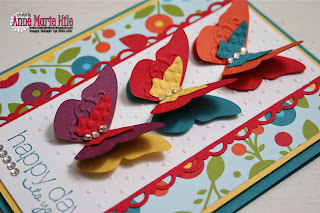 Then I just played off the colors in the paper to create some layered butterflies using the Beautiful Wings Embosslits Die. I added some texture and a little bling (shocking, I know) and there you have it. I'm planning to use this card for one of the projects in my Summer Fun Big Shot class, next month. Speaking of butterflies, we seem to have a lot of them visiting our yard over the past week or so. I snapped a few photos of them to share. They are such beautiful and delicate creatures, aren't they? Oh wow, your butterfly card is just gorgeous. Loving the cheerful colours. 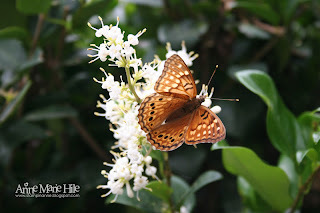 And you are so blessed having those beautiful real life butterflies visiting your backyard - your photos of them is just stunning - its very difficult photographing butterflies. Your card made me smile. Love all the bright colors and your butterflies are beautiful. So beautiful Anne! I love all the bright, fun colours! Great photos too! Can't wait to play along for this one! Happy Weekend! Love love these colors and your dimensional use of the butterflies is wonderful! What a stunner this one is!!! LOVE the way you did the butterflies and the bright, happy DP is fabulous! This is gorgeous, the colors are striking! I love butterflies, they are my favorite. we have so many in our yard as well, wondering if it is from the warm winter. What a bright and joyous palette you chose for this Challenge, it would bring a smile to any-ones face whoever receives this beautiful card. The solid primary colours look wonderful on your butterflies, and draw your eye immediately to them, then you pick up the layers,the dimension and the embossing, just so pretty, as they should be. I am going to CASE this card right now. WOW Love it. Anne Marie, WOW! what a bright and cheerful card! the layered butterflies look like they are about to take flight! What a stunning card, with all your little touches: polka dot embossing and the scallop trim. Simply beautiful! hope all is well. hugs, sharon w.
What a fun card, Anne-Marie! Love those bright colors on your stacked b'flies. Gorgeous and I love that trio of butterflies down the center, especially with the bling! Wow!!! 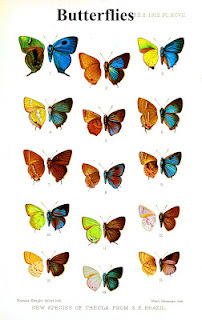 Stunning colorful butterflies! A perfect take on the challenge! Such a beautiful card...great job!!! Another gorgeous creation!!! Love all the great colors you used for the butterflies! Wow! Stunning, vibrant colours and a gorgeous layout. TFS. Oh AM, this is FAB-U-LOUS! Those bright colors are fantastic and so perfect with the butterflies. Love how you embossed only part of the center panel so as to leave room for the sentiment--clever girl! Love the pix of your backyard buddies too. Spectacular card, my friend! What a happy card! The colors are so bright and beautiful - they remind me of summer! And I love your layered butterflies, so fantastic. Have a great week! Beautiful card! 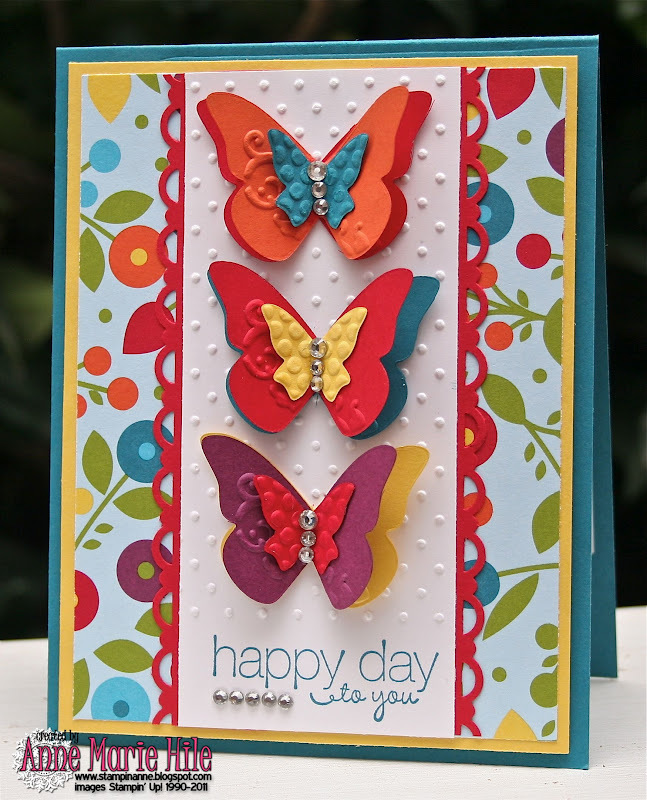 Love the layered butterflies and the gorgeous bright colors! Using bling? YOU?? So hard to believe! We haven't had many butterflies yet, but your pictures are wonderful! They are so fun to watch! So pretty and fun! 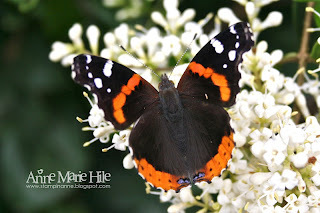 I wish it was warm enough here to see butterflies!!!! So beautiful!!! Love the bright colors on the butterflies and the layout is just fabulous! Amazing! I love the bright colors and layered butterflies!